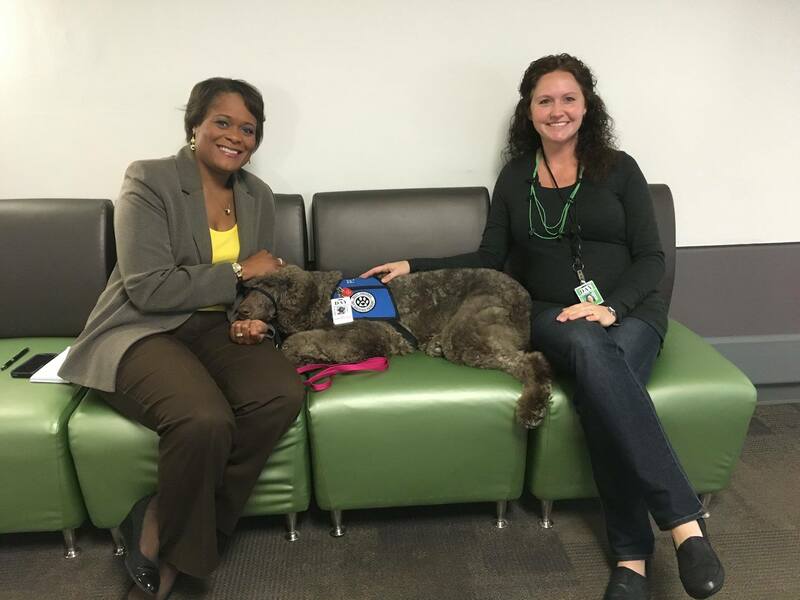 Today, Lisa Smith from Channel 45 News in Dayton, OH, went to the Dayton International Airport to interview Molly Arneson and Kida, members of Best Friends Pet Assisted Therapy, about visiting with travelers and employees at the airport. After speaking with Molly, Lisa Smith went to interview Norma Wetterling Raiff, President of Best Friends Pet Assisted Therapy. 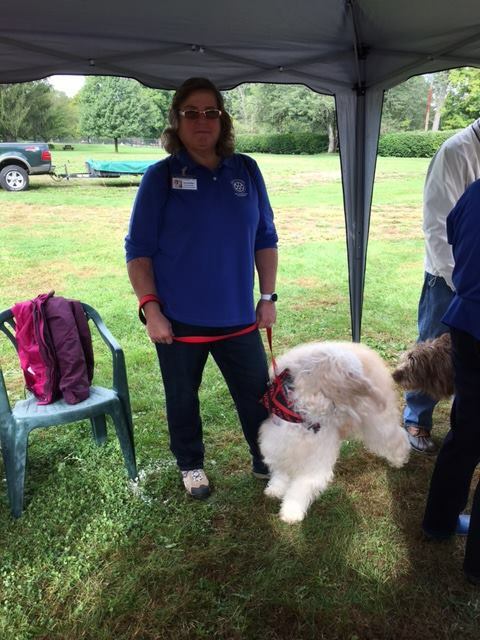 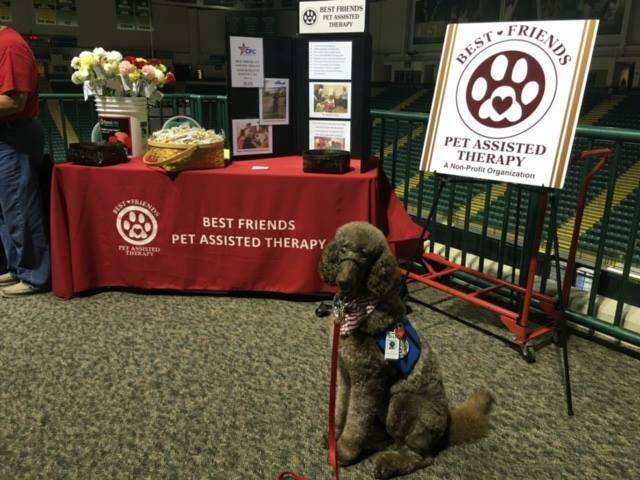 Best Friends Pet Assisted Therapy traveled to Piqua, OH, on October 14, 2016, to participate in a Wellbeing in the Workplace event for the employees of the Upper Valley Career Center. 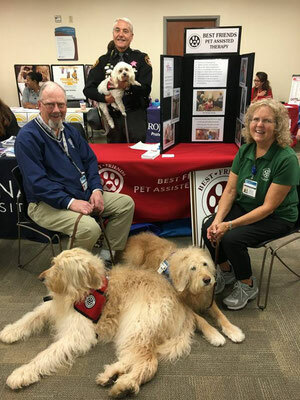 On October 12, 2016, Best Friends Pet Assisted Therapy particiated in the Springfield Regional Medical Center's Health Fair. 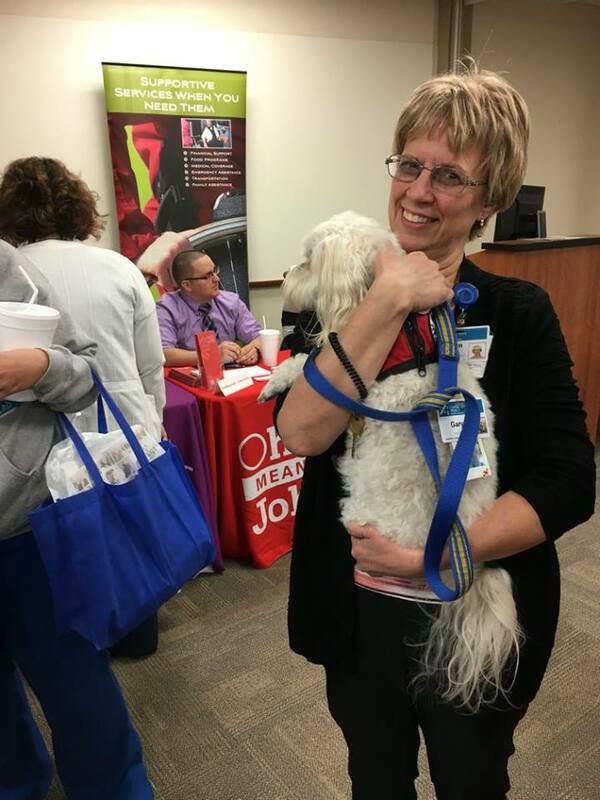 This was held for staff and physicians at the hospital to show what resources were available. 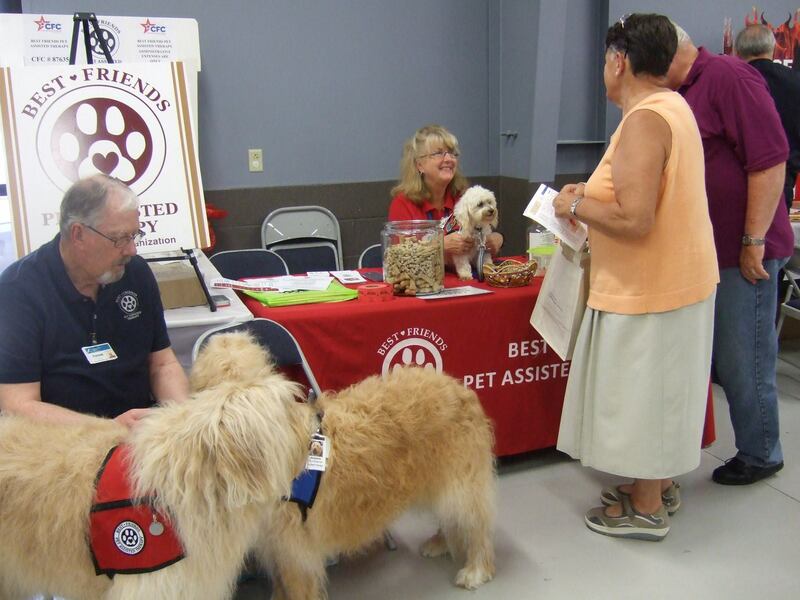 Best Friends Pet Assisted Therapy is going to be at the Nutter Center, Dayton, OH, for the Combined Federal Campaign (CFC) Kickoff. Best Friends Pet Assisted Therapy is approved to participate in the CFC campaign. Our CFC number is 87635. 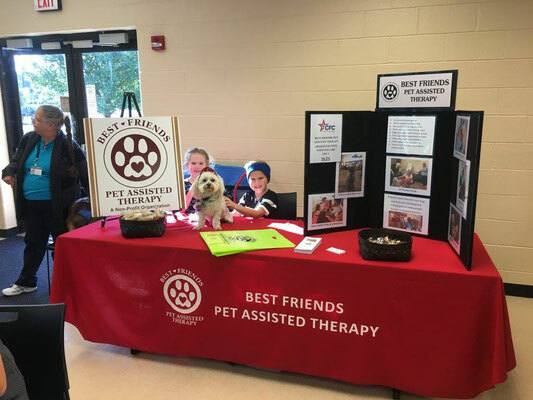 Would really appreciate it if you would consider donating to Best Friends Pet Assisted Therapy by writing down number 87635 on your donation form. 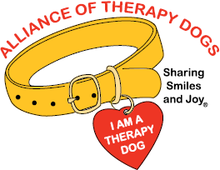 We appreciate all that everyone does to support Best Friends Pet Assisted Therapy. Best Friends Pet Assisted Therapy was at Wuffstock in Snyder Park on October 1, Springfield, OH, hosted by National Trails Park and Recreation. We had our famous kissing booth set up for doggie kisses. We also had our information booth set up to share the joys of pet therapy. 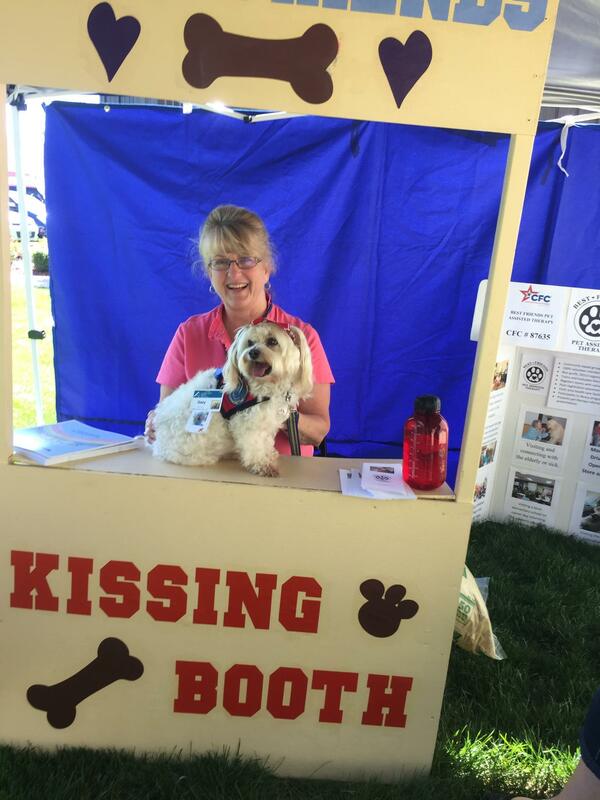 A great group of people showed up today to help out with our kissing booth and infomation booth. 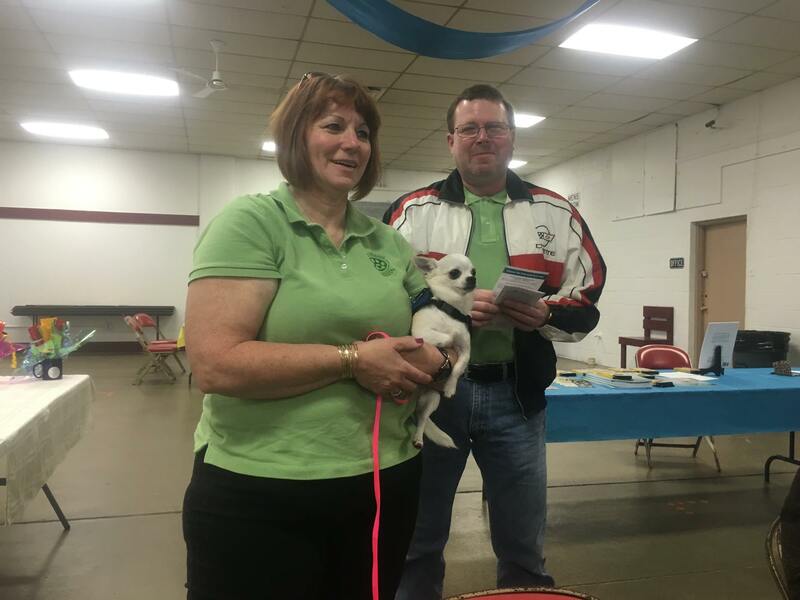 We had two raffles. 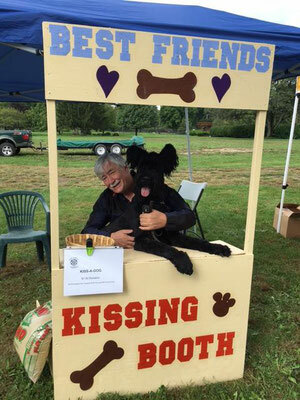 One winner showed up to collect his smoker cooker. Waiting to hear from the winner of the basket. 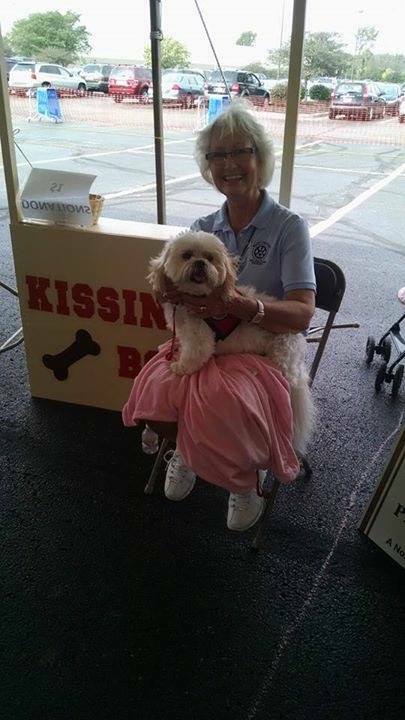 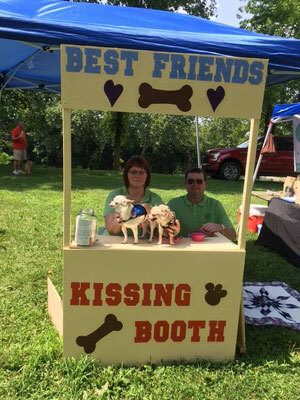 Benjamin Steel in Springfield, OH, requested that Best Friends Pet Assisted Therapy bring their kissing booth to participate in their stress relief event. 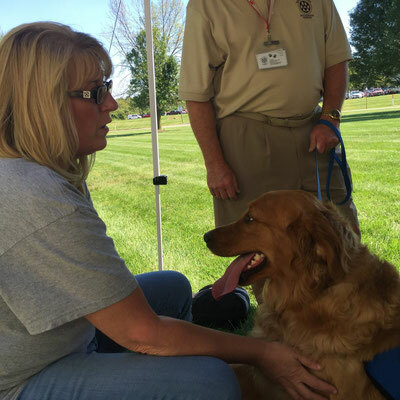 Several teams went to Benjamin Steel on September 21, 2016, to help relieve some stress. 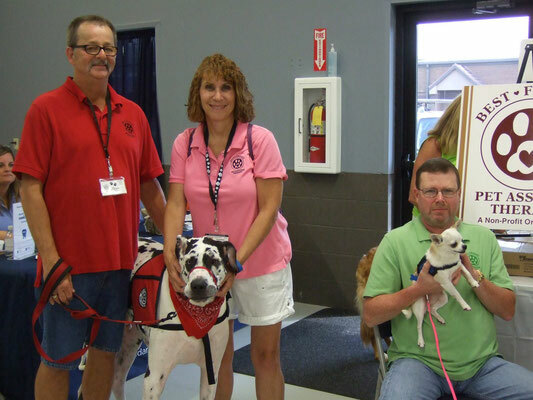 The Humane Society held their big adoption event in the Pet Smart parking lot on September 17, 2016. 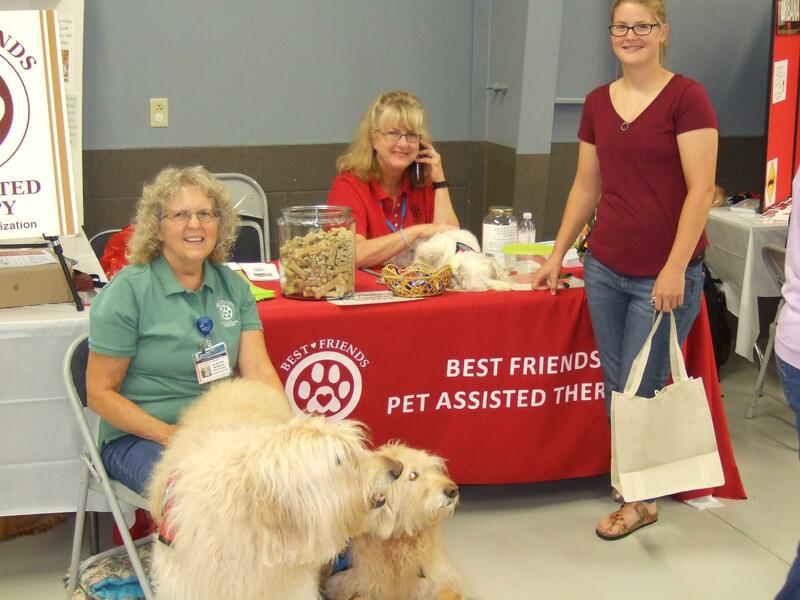 Again, Best Friends Pet Assisted Therapy paid $25 towards each adoption to help reduce the adoption fee. 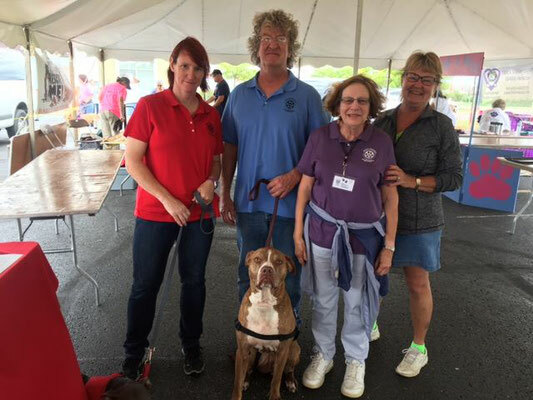 This year there were nine dogs adopted with one returned to the Humane Society the next day. Heard several dogs were adopted as well from the other animal rescue groups that were there. Best Friends Pet Assisted Therapy was there to support the function as well as share the joy of pet therapy at their table. On September 7, 2016, a group of Best Friends Pet Assisted Therapy members worked our booth at the CRSI Annual Health Fair at the CRSI facility in Urbana. We met lots of new friends and was thrilled when our "old" friends came to visit us. 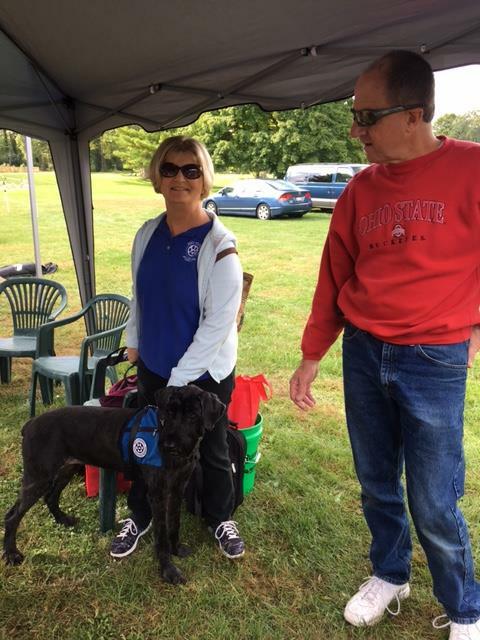 Thanks to all the teams that came out to support the effort. Colby, a Best Friends Pet Assisted Therapy registered pet therapy dog, was featured in an article in the August 28, 2016, edition of the Springfield News and Sun. 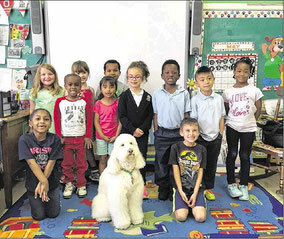 "Colby, a registered therapy dog, visits Mrs. DeWeese’s kindergarten classroom, serving as a listener for students reading aloud. 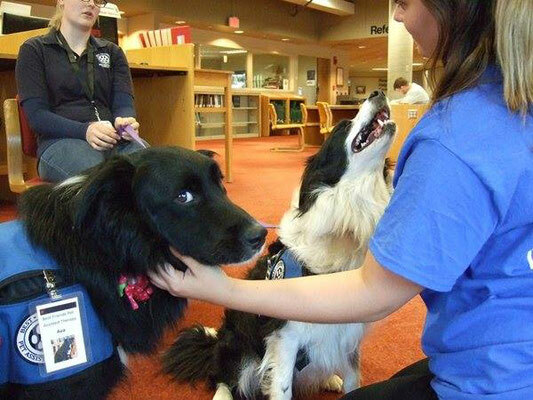 DeWeese loves having Colby visit because Colby helps students become engaged in their reading by being non-judgmental even when students make a mistake. 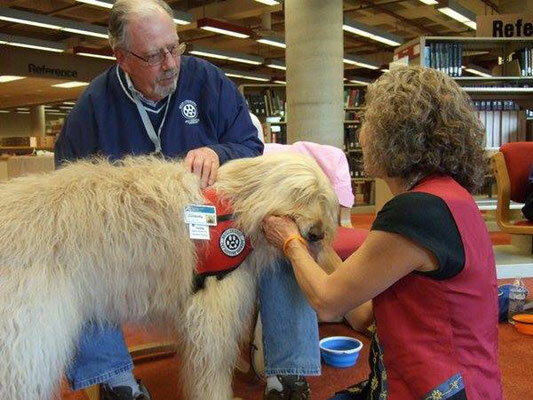 Colby’s non-reaction can help student readers’ self-confidence." 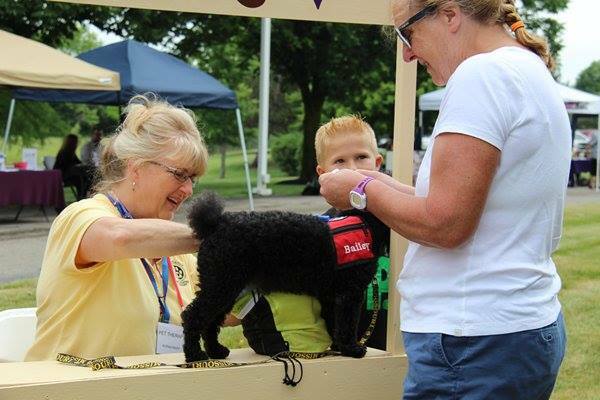 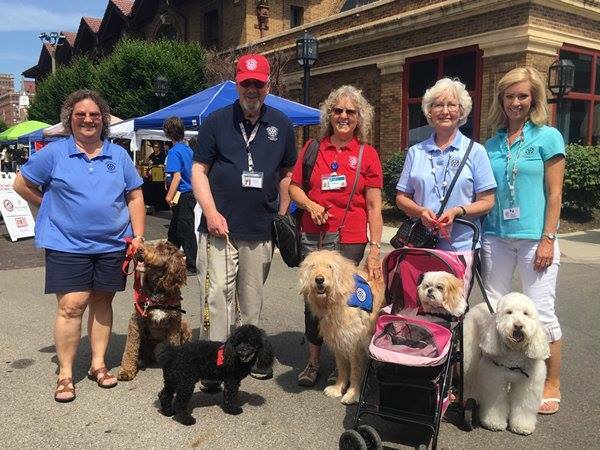 On July 24, 2016, a group of Best Friends Pet Therapy teams braved the heat to visit with the attendees at the 2nd Annual Tails of Two Cities event at Eastwood Park, Dayton, OH. 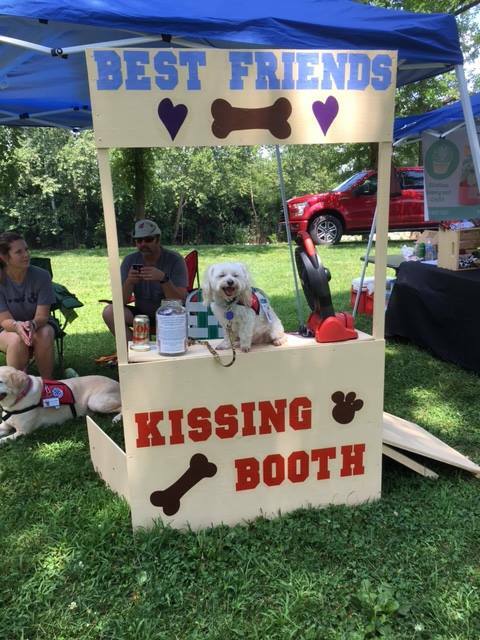 The Best Friends' Kissing Booth was a hit with the attendees. 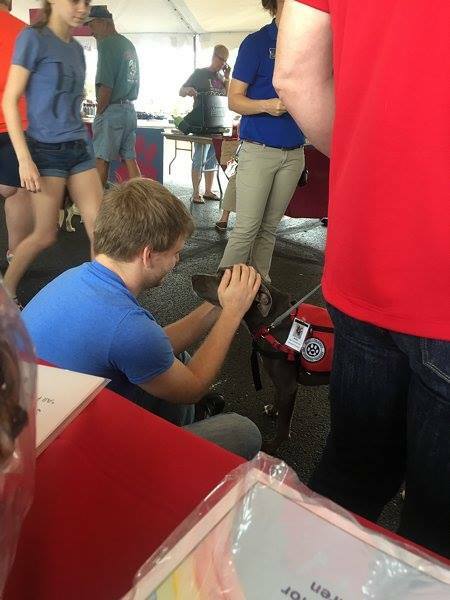 We also got to talk to a bunch of dog owners about the joys of pet therapy and the FREE pet therapy training Best Friends offers! 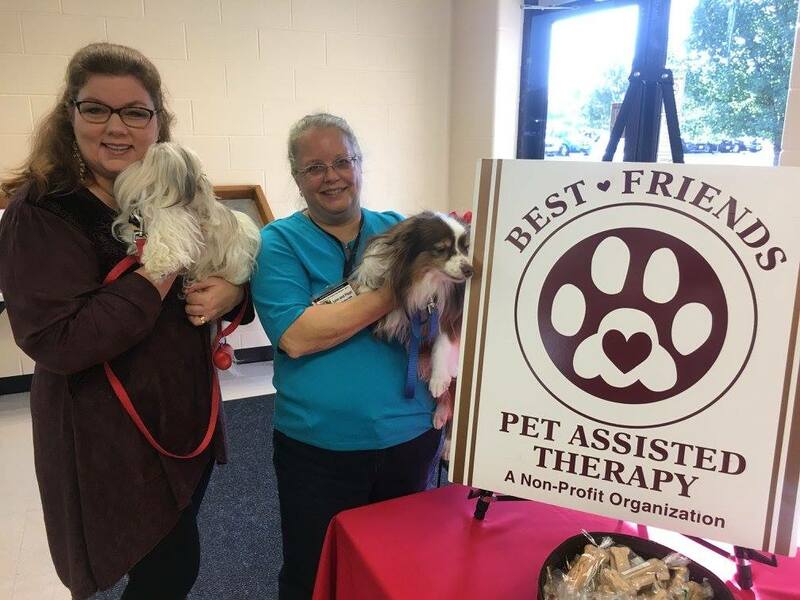 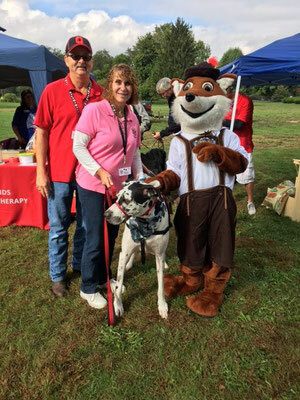 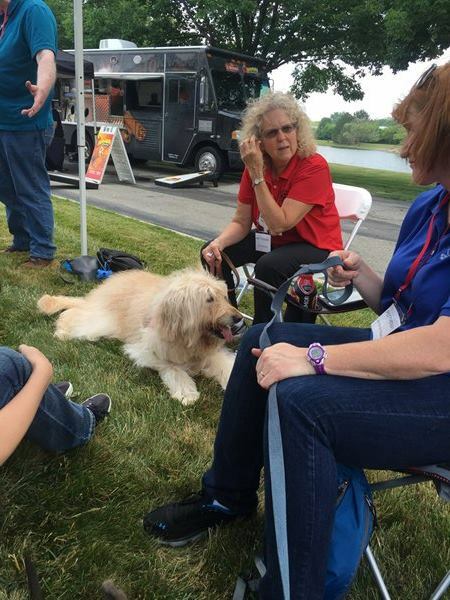 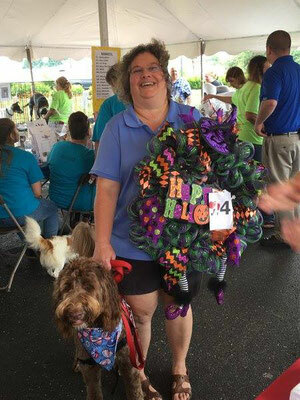 Speedway, LLC, invited Best Friends Pet Assisted Therapy to participate in their annual United Way picnic fundraising event at Speedway Headquarters in Enon, OH. 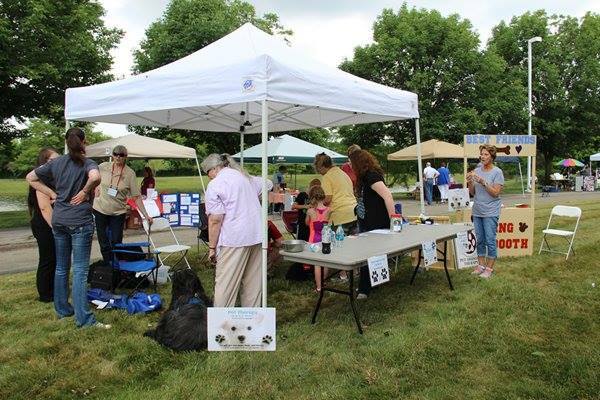 This year the picnic was held on June 23, 2016. 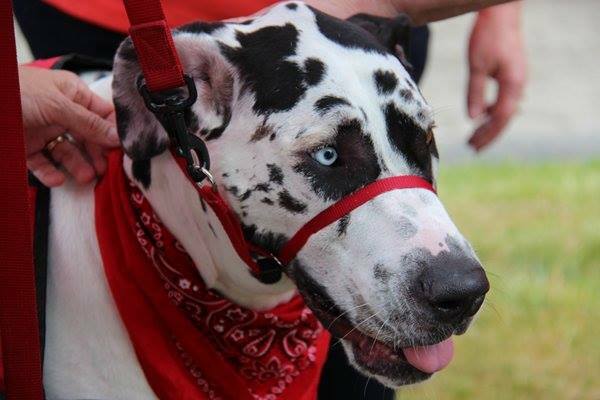 Best Friends Pet Assisted Therapy brought their newly constructed Kissing Booth to the picnic. Whatever money was raised with the kissing booth was split with Speedway and Best Friends Pet Assisted Therapy. 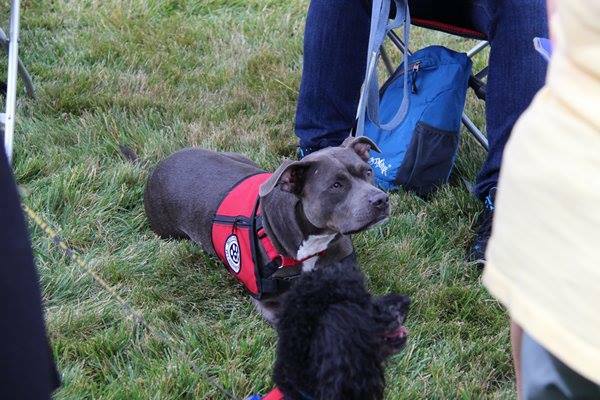 We had a couple junior helpers for the event, too. 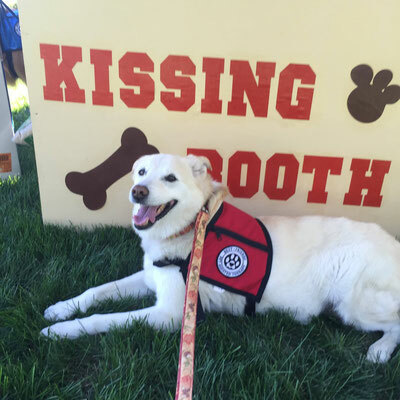 The Kissing Booth was a big hit at the event. 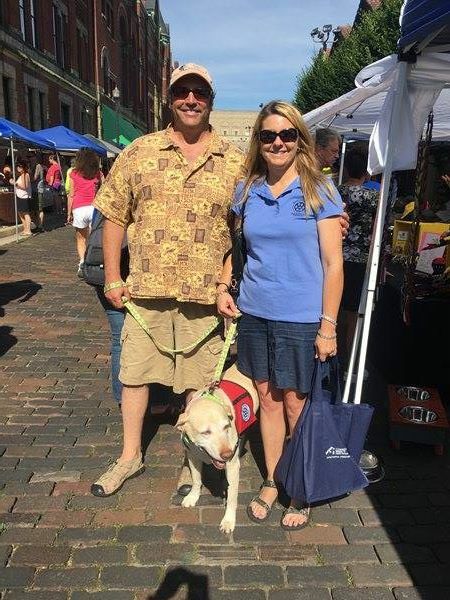 What is better than working at the Farmers' Market and then getting to shop at the Farmers' Market? 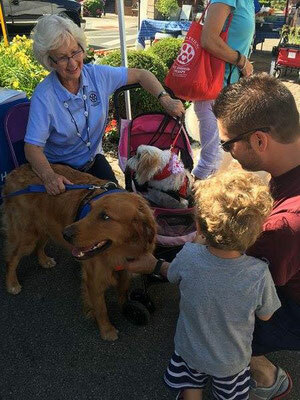 Best Friends Pet Assisted Therapy worked the Community Mercy Health Partners Tent at the Springfield, OH, Farmers' Market on June 18, 2016. They shared with the public the joys of pet therapy. Then when the member's "shift" was done, they got to shop at the Farmers' Market. 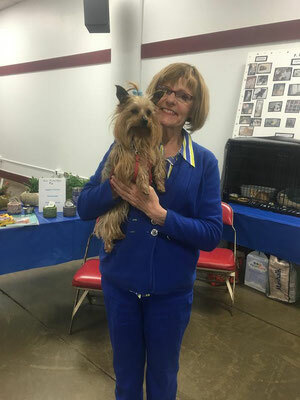 I know I got the best tasting tomatoes from the market before I got my first tomatoes from my own garden. 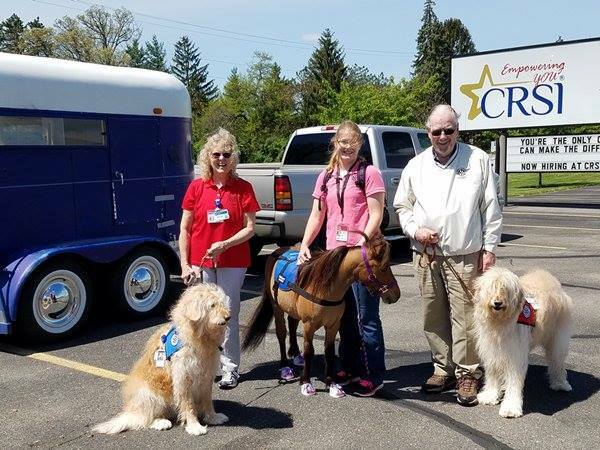 The Urbana Daily Citizen came to Best Friends Pet Assisted Therapy's visit to CRSI on Friday, June 3 and published this article about the visit and Best Friends. They also took this picture of Charlie with Nancy Insley. 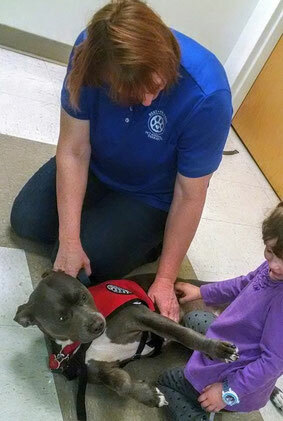 "Members of Best Friends Pet Assisted Therapy visited CRSI in Urbana on Friday. 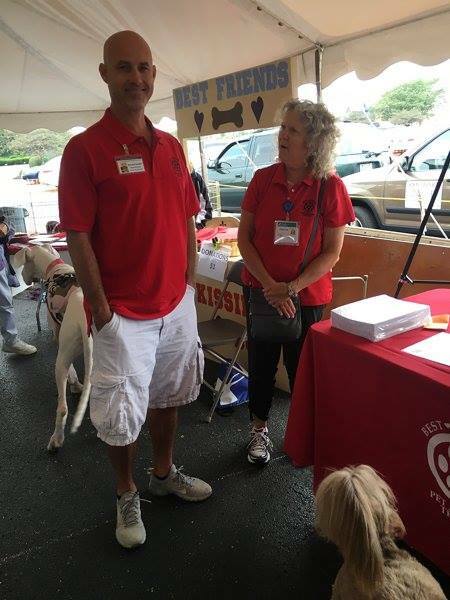 Best Friends is committed to providing support and encouragement to patients and residents in health care facilities and school settings. Membership is made up of the volunteer teams who visit facilities throughout the area, as well as individual patrons and corporate sponsors who support the efforts of these teams through their donations. In photo are therapy dog “Charlie” with handler Nancy Insley. 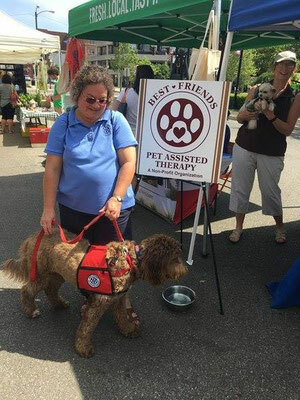 For more information about Best Friends, log on toBestfriendspetassistedtherapy.org or like their page on Facebook." 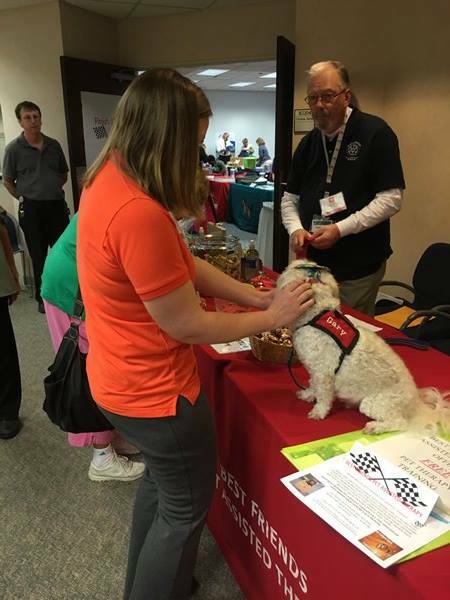 Best Friends Pet Assisted Therapy was again asked to participate in the 6th Annual Speedway Health Fair held on May 26, 2016, at the Speedway Headquarters in Enon, OH. 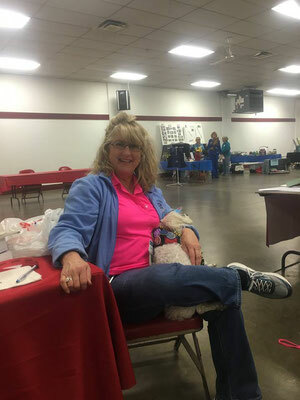 This event is a well organized and fun event to participate in. 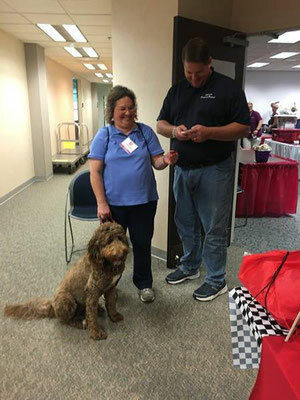 We had lots of fun talking to the employees and vendors. 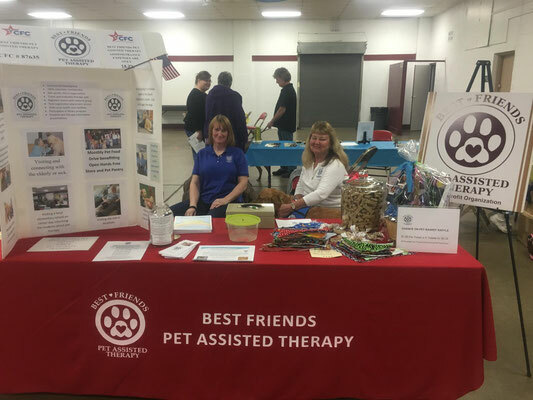 May 15, 2016, found Best Friends Pet Assisted Therapy at the Clark County Fairgrounds, Springfield, OH, at the PUPS Fundraising event. 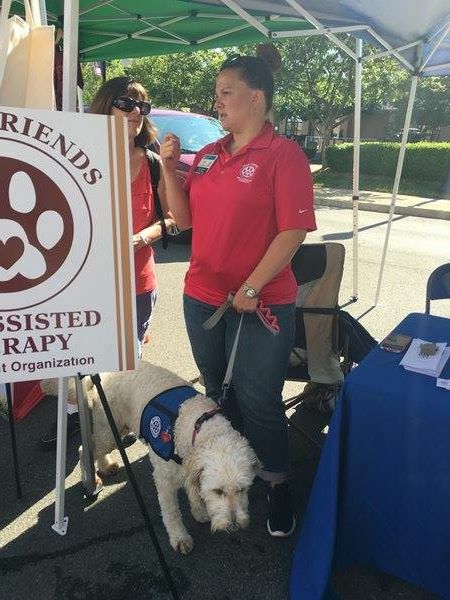 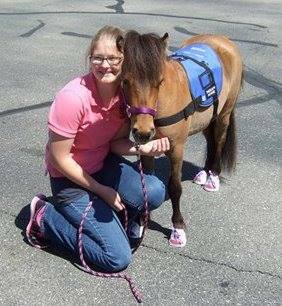 The event wasn't well attended, but Best Friends Pet Assisted Therapy had a great time any way. 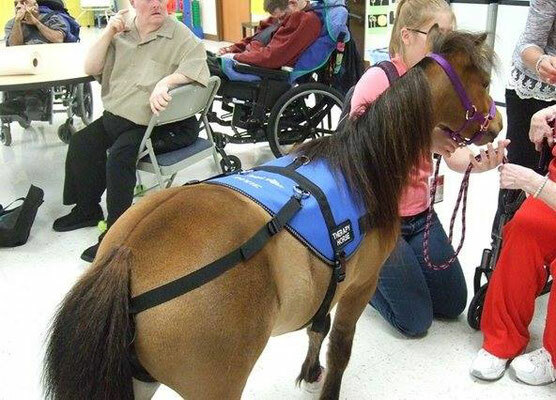 Who said only small dogs could be pet therapy animals? On May 9, 2016, several large dogs and one small horse went to visit Champaign Residential Services, Inc. (CRSI) in Urbana, Ohio. 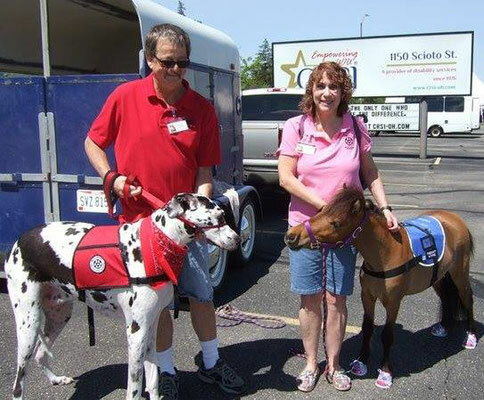 The delight these dogs and the mini horse brought to the residents and staff was amazing. On May 5, 2016, a group of wonderful Best Friends Pet Assisted Therapy teams went to Wittenberg Univeristy, Thomas LIbrary, Springfield, OH, to participate in a Stress Relief visit with the students and staff. 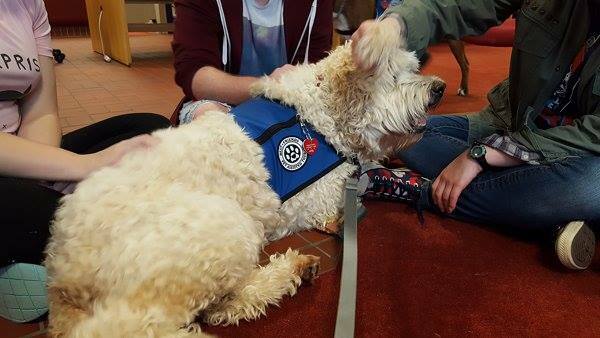 While the stress of finals week was mounting, coming to pet and visit with the pet therapy dogs helped the students release their stress of the week. 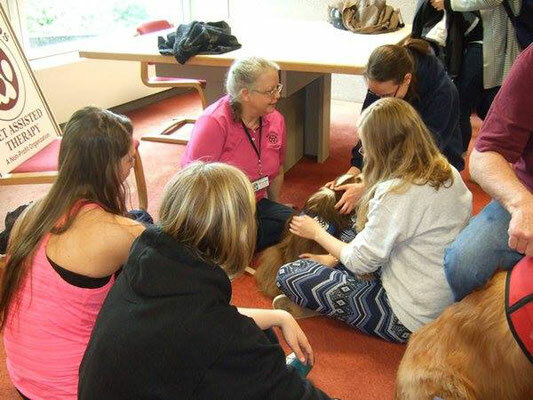 Now going to take their finals stress free, the students were much more relaxed and probably achieved higher grades on their exams. 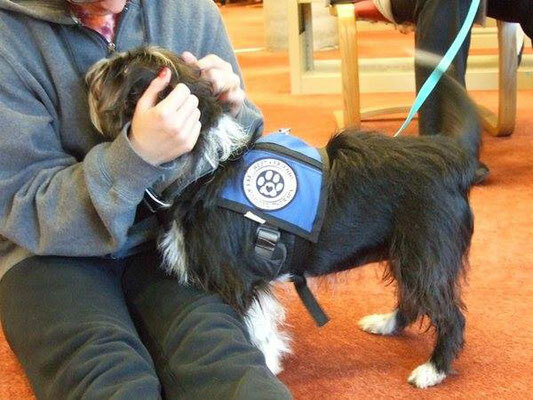 What a great program for Best Friends Pet Assisted Therapy and the students at Wittenberg University. On April 7, 2016, a group of Best Friends Pet Assisted Therapy teams went to National Trails Parks and Recreation in Springfield, OH, to speak with 2-4 year olds about dog safety. The discussion was led by Kristin Crankshaw. 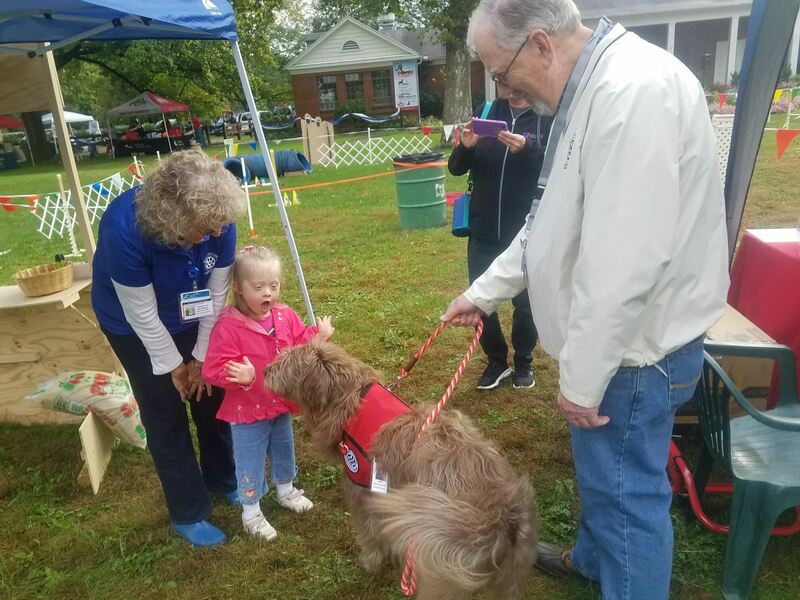 The kids had a great time visiting with the group of dogs. 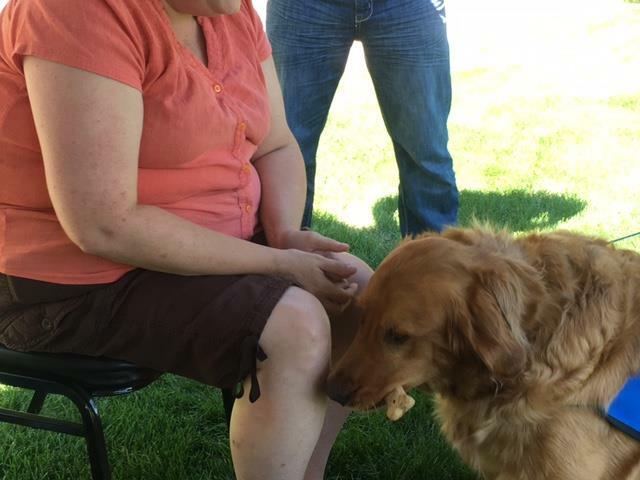 Present were big dogs and little dogs. Keri and Boston Visit Miami University! 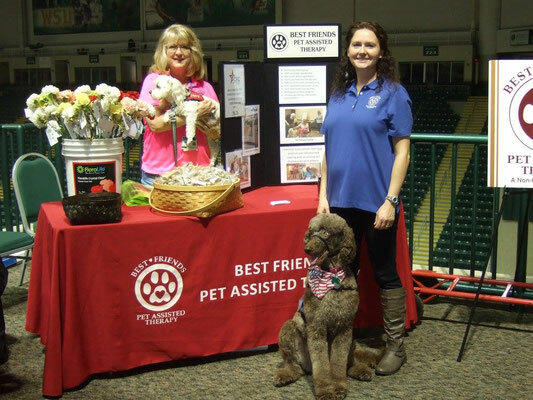 On February 27th and 28th, 2016, Keri and her Best Friend, Boston, attended the Paws for a Cause at Miami University, Miami, OH, before both the Men's and Women's basketball games. Keri and Boston was able to share the joy of pet therapy with the crowd as well as the wonderful work Best Friends Pet Assisted Therapy does. 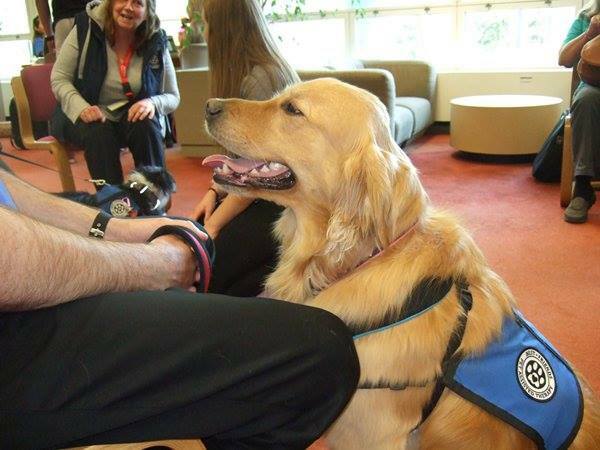 Dayton Daily News article, in part, from February 26, 2016, on Kida visiting at the Dayton Airport. 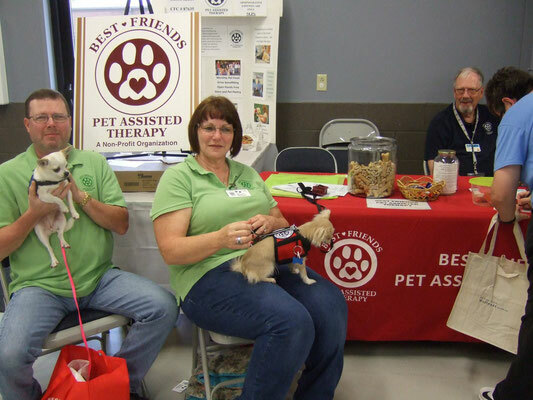 Best Friends Pet Assisted Therapy is noted as the pet therapy group that Kida trained with for pet therapy. 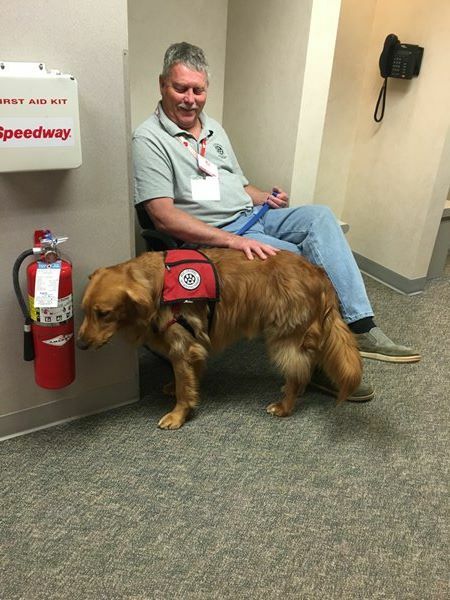 "Travelers passing through the Dayton International Airport can now be greeted by a therapy dog. 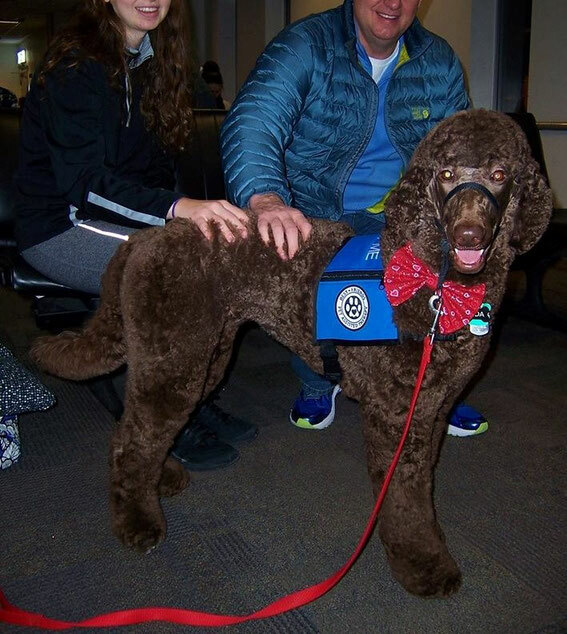 Kida, a chocolate goldendoodle, and her handler, Molly Arneson, volunteer at the airport at least once a week to help travelers relieve the stress that can come with flying. 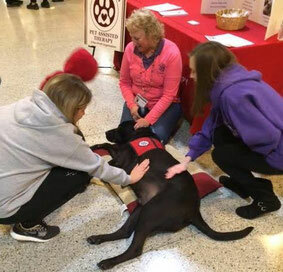 Officials at Dayton International Airport decided to allow Kida and Arneson to volunteer to help travelers cope with anxiety-related travel issues such as canceled flights and long waits, said Linda Hughes, Dayton International Airport Spokeswoman. 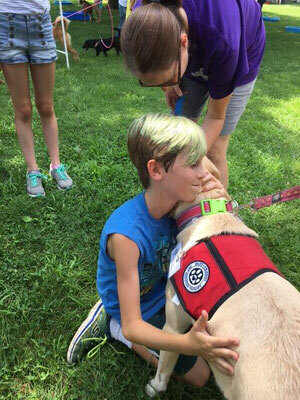 Kida was born and raised at 4 Paws for Ability in Xenia, a non-profit organization that trains service dogs for children with disabilities. She has lived with Arneson since she was 14 weeks old and was trained at Best Friends Pet Assisted Therapy in Springfield. Arneson and Kida were certified in October. 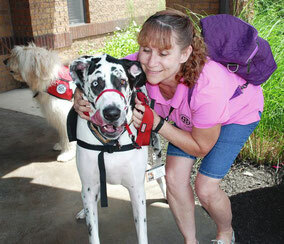 Arneson said she decided to volunteer with Kida at the airport because they live nearby. She said the days she brings Kida to the airport depends on her children’s schedule. 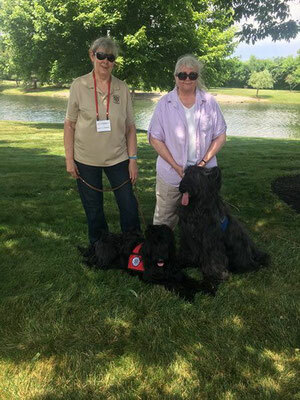 In between volunteering at the airport, Kida will also be a breeder, with plans for her puppies to become future service dogs, Arneson said. Other airports around the country, including those in San Jose, Miami, San Antonio, Oklahoma City and Los Angeles, also bring in service dogs for their passengers, according to a release from the Dayton airport." 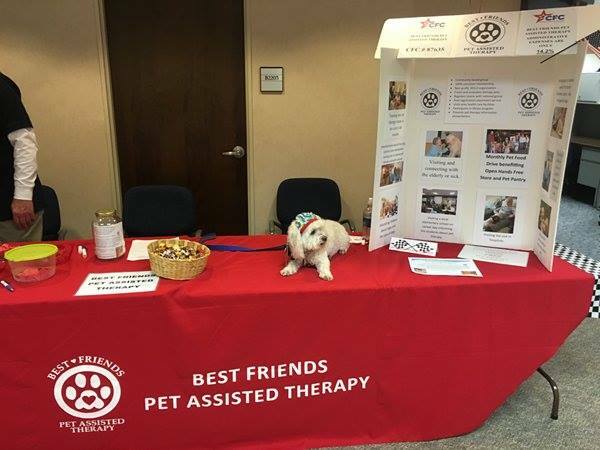 Best Friends Pet Assisted Therapy is an ALL VOLUNTEER, 501(c)3, NON-PROFIT, TAX DEDUCTIBLE Organization established in 2006.